This newsletter is an archived publication and may contain dated technical, contact, and link information. Contact LTPP Customer Support Service Center at ltppinfo@dot.gov if you would like to be added to our email distribution list for LTPP Newsletters and other announcements. The need for forensic evaluation of LTPP test sites has been discussed for nearly the entire life of the program. 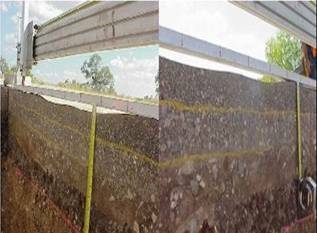 There is a widespread agreement that forensic investigation of LTPP test sections should be pursued, especially for the Specific Pavement Study (SPS) test sections. It has also been said that premature failures, as well as the exceptional performers, must be examined closely if we are to fully understand why pavements have performed as they have. Despite all the discussion, forensic investigations have remained an illusive challenge facing LTPP due to program resource constraints. 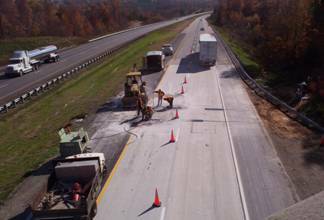 However, the Federal Highway Administration (FHWA) recently awarded $120,000 of Focus Area Leadership and Coordination (FALCON) funds to the LTPP team for forensic investigations this year to examine pavement distress causes and mechanisms. The plan for conducting the investigations was discussed at the Transportation Research Board (TRB) LTPP Special Activities Expert Task Group Meeting on April 2 and April 3 in Woods Hole, MA. The investigations will follow the guidelines in the "Framework for LTPP Forensic Investigations - Final" developed in April 2004 to promote consistency and uniformity and to maximize their benefits. Key elements of the guidelines include distress mechanism investigations and surveys, the collection of missing/ desirable data, and measurements of material properties, within-section layer thicknesses, end-state physical properties, deflection, and profile. The plan focuses on SPS test sections scheduled for rehabilitation. Selection will be based on the key distresses to be investigated, as well as the geographical/environmental coverage they provide. The lessons learned at the selected SPS test sections will provide the basis to refine the LTPP plan for future forensic activities at other sites and to develop a national workshop with presentations on forensic techniques and hands-on field work for attendees. Figure 1. Photograph of a forensic trench in Texas. Currently LTPP forensic investigation activities are planned for test sections at four sites: the Arizona SPS-5, the New York SPS-8, the Ohio SPS-1, and the Texas SPS-5. The test sections are hot-mix asphalt surfaced pavements that exhibit cracking and some rutting. For more information about the ongoing LTPP forensic project, contact Jack Springer at jack.springer@dot.gov or (202) 493-3144. DiVa was originally developed as a stand-alone PC-based software application designed to assist the LTPP regional contractors with distress data collection. Since the debut of this software in 2000, it has evolved from a stand-alone application to an online application giving users the ability to review manual and automated distress surveys. DiVa Online is a software application that can be helpful in analyzing distress information by graphically displaying LTPP distress data. The distress data can be displayed to show a time series/time history of a pavement section under evaluation. DiVa provides two report types: data table and graph. The data table report can be exported to Excel. The graph displays a current trend line and a variability (standard error) band, and can analyze several LTPP survey sections at the same time. The user can also view distress maps, photos or digital images of each distress survey analyzed. To access the software or for more information, visit: www.ltpp-products.com/Diva/index.aspx. FHWA has been developing tools that State highway agencies can use to collect quality WIM data. FHWA held a pilot workshop from May 13 to May 15 in Sacramento, California to present these tools which are based on the results from the LTPP SPS Traffic Data Collection Pooled-Fund Study, TPF-5(004). While many agencies have their own traffic programs, this workshop uses the successful techniques from the traffic pooled-fund study so that States can use their own staff to collect quality traffic loading data for research studies, national reporting to FHWA, and as inputs to pavement design programs such as the Mechanistic-Empirical Pavement Design Guide. Figure 2. Pooled Fund WIM Installation on U.S. 29 near Danville, VA.
FHWA plans to hold additional workshops on a regional basis, so if you are interested in attending or would like to host this workshop in your State, please contact Mike Moravec at mike.moravec@dot.gov or (202) 366-3982. For more information about the traffic pooled-fund study, contact Deborah Walker at deborah.walker@dot.gov or (202) 493-3068. A study was conducted to compute in situ soil parameters based on Time Domain Reflectometry (TDR) traces obtained from LTPP test sections instrumented for the seasonal monitoring program. 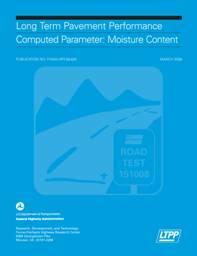 A comprehensive description of a new method developed as part of the study to estimate moisture content, dry density, reflectivity, and conductivity of the soil from TDR traces is provided in the report. This new method utilizes transmission line equations and micromechanics models calibrated to site-specific conditions for each site/layer combination. Background information on existing empirical methodologies used to estimate subsurface moisture content from TDR traces is also documented. The results were compared to previous methods as well as ground truth data to evaluate the ability of the new model to predict soil parameters. The transmission line equation and micromechanics method was found to provide accurate results and was used to interpret more than 270,000 TDR records stored in the LTPP database. A computer program (MicroMoist) was developed to aid in the computation of soil parameters based on TDR trace data and calibration information. Details on the program are provided along with descriptions of the tables developed to store the computed values in the LTPP Pavement Performance Database. To learn more about the LTPP program and products, visit www.fhwa.dot.gov/pavement/ltpp/index.cfm.